What do you remember about your mitzvah? and why are you a Mitzvah DJ? 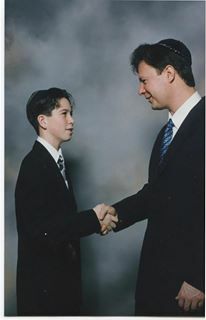 My bar Mitzvah was in 1998. The service was on Saturday morning February 7th The party was February 8th at the Rosewood Banquets in Rosemont. Gail Smith was the party planner that helped my mom decorate the room. My theme was Hockey. Every table had a centerpiece in the middle. Each centerpiece was a different silhouette hockey player with a pennant from each team in the NHL My head table had more kids then all the other tables. Each kid got a cool rotating light up 8 ball as the main give-a-way. But each of the 8 balls were sitting at the tables when everyone came in. Rock Candy was also on everyone’s plate as they entered the room. 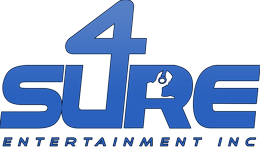 Bizar Entertainment provided the Djs, Emcee, and Dancers. I remember we had 9 (NINE) YES nine dancers at my party. We had intelligent lighting. This cool guy named Marz actually showed up for a few minutes and rocked the crowed. Lance Did the robot. Everything was perfect….with one exception… My introduction song was Will Smith, Men In Black (yes the joke is funny, I came into Will Smith’s music and kids now listen to his son & daughter). The middle of the party was a blur. I remember getting lifted up in the chair for the hora, I remember watching the montage with all my friends, and I remember the awesome sweet table. At the time, it seemed like my party was only 20 minutes long. I had such a fun time, I couldn’t wait until my sisters. Fast forward. At my sisters bat mitzvah, the same crew came. I was told I could join the team when i was a freshman. I went to a wednesday night practice. My first job was to load equipment into Cubby Bear North in lincolnshire. My second party was another “training event” that took place at Maggiano’s Schaumburg. 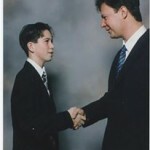 The first Bar Mitzvah, where i was the Mitzvah Dj, was at North Shore Congregation Israel. I was only 15 years old, and was hired to be the Dj. it was my first time without anyone telling me what to do. I must have done a decent job for the company to keep me on. almost 14 years later, I’m here read to be YOUR next Mitzvah Dj.